The following is a short compilation of different aspects of a typical webpage and how a search engine like Google views each characteristic. It is not exhaustive, but should give you enough to understand the basics. 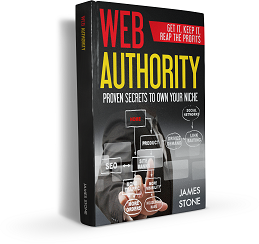 These are excerpts from the book “Web Authority” available to own. Keyword use in document title: The title is the text within the <title>…</title> tags in the HTML code of your web page. Global link popularity of web site: The global link popularity measures how many web pages link to your site. The number of web pages linking to your site is not as important as the quality of the web pages that link to your site. All major search engines take the quality and the context of the links into account. Search engines assume that your web page must offer relevant content if many quality sites link to it. Link texts of inbound links: Inbound links are links from other web sites to your site. If many other sites link to your site, then Search Engines consider your site to be important. However, the number of links is not as important as is the relevance of the linking page and the link text used in linking to your site. Keyword use in body text: The body text is the text on your web page that can be seen by people in their web browsers. It does not include HTML commands, comments, etc. The more visible text there is on a web page, the more a search engine can index. The calculations include spaces and punctuation marks. Age of web site: Spam sites often come and go quickly. For this reason, search engines tend to trust a web site that has been around for a long time over one that is brand new. The age of the domain is seen as a sign of trustworthiness because it cannot be faked. The data is provided by Alexa.com (or Archive.org if Alexa.com does not have data about a site). Keyword use in H1 headline texts: H1 headline texts are the texts that are written between the <h1>…</h1> tags in the HTML code of a web page. Some search engines give extra relevance to search terms that appear in the headline texts. This chapter examines if this applies to Google.com (without Places), too. Keyword use in domain name: The domain name is the main part of the web page address. Google.com (without Places) gives extra relevance to search terms within the domain name. In the past, this was a major factor. If you sold light bulbs and owned lightbulbs.com, you would never have to advertise your website. Keyword use in page URL: The page URL is the part after the domain name in the web page address. Google.com (without Places) gives extra relevance to search terms within the page URL. Separate your search terms in the page URL with slashes, dashes or underscores. Links from social networks: On social network sites, people decide which web sites are popular. This means that the popularity on social network sites cannot be easily influenced. For this reason, search engines might trust web sites more if they are popular on social networks. Other factors such as server speed, use of your keyword phrase in H2 to H6 headline texts, and use of the phrase in an IMG ALT attribute matter. Bolding a keyword phrase in the body of the article, overall traffic, keyword use in same domain link texts also matter. This is just a small sample of the most important aspects of optimizing a webpage for search engines. Does Google Uses the Keyword Meta tag?